Deutsch: Na klar! 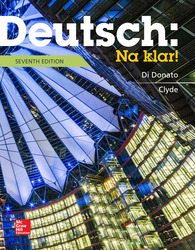 engages students with its unique integration of authentic materials and targeted listening and speaking activities, contemporary culture and communicative building blocks, providing the tools they need to build a solid foundation in introductory German. The print Workbook/Lab Manual is now integrated into a single volume to make these supplements more user-friendly. Interactive vocabulary presentations (Wörter im Kontext) with audio allow students to listen, record, and practice the new vocabulary at home. Succinct and clear grammar explanations make learning grammar at home easy for students. Online Guide to Grammar Terms provides additional grammar help for students. It is coupled with point-of-use references in the student text. A rich array of authentic materials with accompanying activities and exercises brings real-world use of the language into the classroom. Updated cultural readings (Kulturjournal) focuses on chapter-relevant topics. Each chapter contains two such readings, accompanied by eye-catching imagery and discussion questions. Kulturspot features highlight interesting and relevant cultural tidbits at relevant points in each chapter. An all-new video program with accompanying activities expose students to the sounds of a variety of German speakers from many different regions. Every five chapters includes Videoclips, a set of review clips and activities that recycle and spiral topics and vocabulary from the previous five chapters. The program begins with a focus on the world of the learner (Ch 1-4), moves to the survival world (Ch 5-10), and culminates in the world of issues and ideas (Ch 11-14). Sprach-Info: Asking when using Um wie viel Uhr? Robert Di Donato is Professor of German and Chair of the Department of German, Russian, and East Asian Languages with Hebrew and Arabic at Miami University in Oxford, Ohio. He received his Ph.D. from The Ohio State University. He is the chief academic and series developer of Fokus Deutsch, a telecourse with accompanying texts and materials for teaching and learning German, and coauthor of The Big Yellow Book of German Verbs. He has also edited two volumes for the Central States Conference, written articles aout language methodology, and has given numerous keynote speeches, workshops and presentations - both in the United States and abroad - on teaching methods and teacher education. He has won a number of awards for his work in language education, including the Florence Steiner Award for Leadership in Foreign Language Education. Monica D. Clyde is a native of Düsseldorf. She received her Ph.D. in German literature from the University of California at Berkeley. She has taught German language and literature at Mills College, Cañada College, the Defense Language Institute, and the College of San Mateo. She was Director of Faculty Development and Scholarship at Saint Mary's College of California until her retirement in 2003. She coauthored Texte und Kontexte and was contributor to Mosaik: Deutsch Kultur und Luteratur, Third Edition, both intermediate college-level German textbooks.